Christopher Nolan (Memento, The Dark Knight) is a cinematic architect. His films are crafted with psychological precision and care, despite their messy themes and characters. Nolan is fascinated with the architecture of the mind, obsession, and the infectious power of ideas. His latest, most ambitious endeavour and first original work since his debut, Inception, is a bold, outstanding piece of cinema that may not be the revolutionary masterpiece some expect, but is an incredibly conceived story told in an inventive way as a "dream-based heist thriller". Inception builds within its own internal structure like a dream. It is layered with subconscious identities, likely mirrors of Nolan's own personality. The film is a thoughtful character piece about dreams and the structure of the human mind with parallels to a film like Eternal Sunshine of the Spotless Mind except wrapped around a thrillingly intense action movie. At the core of dreams are ideas planted in your mind that reflect in your own constructed dream scape. Leonardo DiCaprio's Cobb is the Extractor, who exploits these factors for financial gain. Cobb enters a third party's dream with the goal of stealing an idea, but in this time he must plant one in somebody's mind. This allows for the premise of a heist that takes place in a constructed dreamworld. Cobb builds a team of experts in different fields to pull off one last job. The cast is remarkable. Tom Hardy (Eames, the Forger) and Joseph Gordon-Levitt (Arthur, the Point Man) are bad asses is the greatest mold and build a comedic tension with each other. Ellen Page (the Architect) has a thankless role as she plays the cipher for the audience. She is the new team member charged with asking questions and having others explain the plot mechanics to her. Oscar-winner Marion Cotillard is a very compelling portrait of the perils of destructive dream-making, reeking havoc in Cobb's mind. 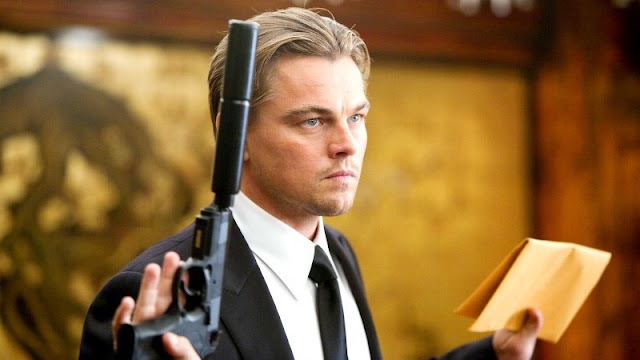 DiCaprio plays a tortured soul well, but his complex character dynamics make it difficult to fully understand his arc unlike his very similar role in Shutter Island. In many ways, the film plays as a standard heist film replete with sequences that set the rules of the game and a third act set in a snowy James Bond style hideaway compound. The way Nolan crafts his dreamworld is through literal interpretation. The dreams are carefully constructed to replicate the real world except when certain rules come into play to disrupt the dreams. The cinematography, editing, mise-en-scène, production design and visual filmmaking is superb. The writing, while very exposition heavy, works on the surface level as it engages the viewer along for the ride with an emotional edge. Hans Zimmer's score is beautifully gripping and creates great suspense. A lot has been said about the epic, masterful nature of Inception, but it plays more like a modern heist film told in the most elaborate, thoughtful way possible. While complex, Inception explains every step and plot point almost to its detriment. Characters spit out an incredible amount of exposition, building up and explaining the mechanics of entering dreams. So much is explained constantly while characters are doing important tasks and upon entering the main dream in the plot, rules are broken and changed very quickly in order to add stakes and build tension. The action is incredible. There is a zero-gravity fight scene that is breathtaking, original and highly imaginative. All the action is organic from the story and the special effects are amazing as it builds internally within the logic and structure of the film. The entire film feels like a dream with each layer becoming more intricate and suspiciously surreal. Nolan brings a sort of literal, real world logic to the dreamworld, giving it a defined structure on how these constructed dreams work. It is very intriguing, but almost deludes the unexplainable, wondrous nature of dreams. Like with The Dark Knight, Inception is massively ambitious, filled with so many plot mechanics that upon reflection feel confusing and overly complicated. However, the film's pace is so fluid that during the film, it is never questioned during the momentum of the film. Afterward, ideas, plot points, and character motivations are easily questioned but, then again, those can be explained away with the inconsistencies and complications of dreams themselves, their ideas, and the ongoing contradictions of the human mind. Inception is an stellar piece of cinema with its intricately written story and action. Christopher Nolan builds an incredible dreamworld on multiple levels that reflects the obsessions of the mind. A gripping action drama set within the architecture of the mind, Inception plays as a complicated but highly satisfying mind-bending heist thriller that often makes little to no sense, despite being surprisingly straightforward and adhering to a strict set of logic and rules, much like a real dream.